Freudenthal CS-55 1-Legged Comfort Stalls are constructed of our heavy duty 1 9/10" 9 gauge high tensile strength triple coated galvanized steel. They come standard with a heavy steel rust guard and a 28" solid shaft inside post. 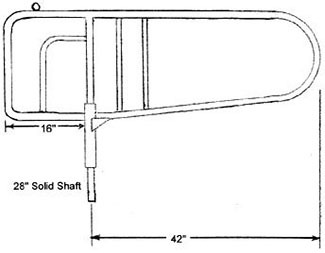 Gussets are welded to each side of the posts for added strength. 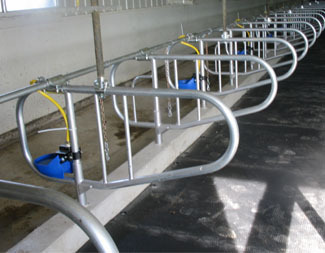 CS-55 Comfort Stall has a freestall design constructed out of 1 9/10" 9 gauge triple galvanized steel, has no back leg to interfere. 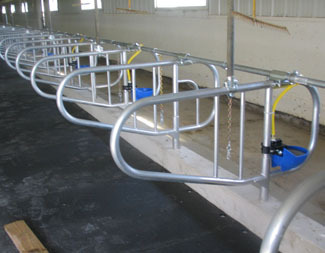 Includes 48" of top rail pipe, top rail clamp, stall chain with push in snap, and stall chain clamp. Total stall weight is 90 lbs.